If you read my blog regularly, you may remember that through a potential act of karma, I recently got a small utility trailer. While its price was certainly right (free), it did need new lights and wiring, new decking, new wheel bearings, and a new coat of paint. And you know what? It would've been great for what it was intended to be—a utility trailer. While I'm certainly not looking a gift horse in the proverbial mouth, I've long dreamed of having a trailer we could take camping or traveling with us; something like a Dinoot Trailer. Dinoot is the brainchild of Scott Chaney, owner of Compact Camping Concepts in Salem, Oregon. The modular Dinoot trailers feature welded frames and fiberglass sides along with a host of options. The little one pictured here is a custom "micro" version," which has been narrowed 13" compared to a standard-sized J-Model. I had actually contacted Scott about purchasing some LED trailer lights for the "karma trailer" and had some separate rooftop tent discussions. He had sent me a link to some products, and I happened to see the micro Dinoot was for sale. Oh man, it is so cool! It's so yellow! It's so small! It's so for sale! Of course, I then had to show it to my better half. "I think that's more of what we really want," Mercedes said. I totally agreed. We can still haul stuff like yard debris and building supplies, however, we can also haul camping gear. And since it's got Thule crossbars, we can use it as a platform for a rooftop tent. 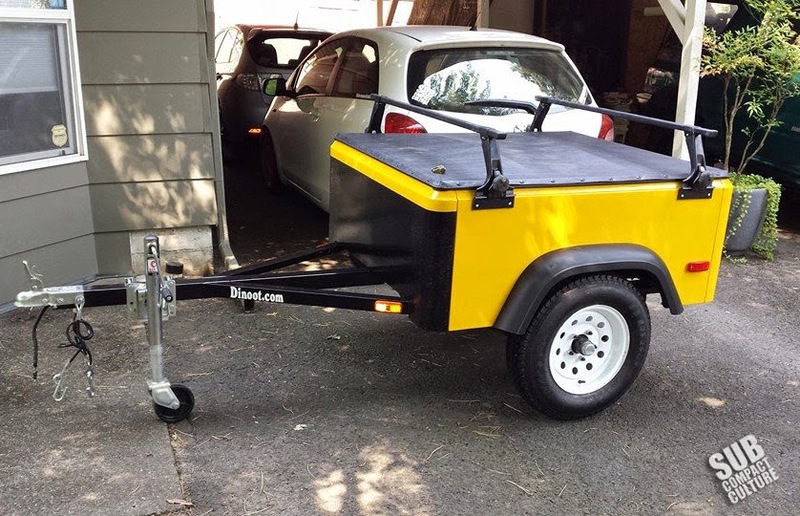 After taking some measurements to ensure that it'd house our gear (and to make sure we could put it somewhere), we decided that the bright yellow Dinoot would be a great choice for a versatile trailer to tow behind the Sidekick or even our WRX. Heck, even our Yaris could pull it. We darted down to Salem to take a look at the trailer. This custom unit rides on the aforementioned welded square-tube chassis that's much sturdier than the bolt-together units found on many inexpensive utility trailers. It has 13" wheels and tires and a 900+ lb. capacity in its current state. The capacity can be bumped up to over a 1,000 lbs. with the addition of another leaf spring, too. The Dinoot's bed wears a coating of bedliner for protection (as does the front panel), and a few tie-downs allow us to secure our gear inside. Across the top is a custom tonneau cover to keep the elements out. It also has LED taillights, a locking tailgate, the Thule crossbars, and enough storage on the tongue for a cooler. The whole thing only weighs 300 lbs. and can easily be moved around the yard by one person. Plus, it's so light you don't even know it's there when towing. While beefier wheels and tires would be nice (and I can lift it 4" by simply flipping the leaf springs), I think we'll probably just paint the wheels black for the time being so they match the Sidekick. We will be looking for a rooftop tent soon, too. We're really looking forward to taking this little trailer out on its first adventure and finding a rooftop tent that suits our needs. Plus, it'll make packing for camping trips a lot easier. It should make for a great traveling companion. Oh, and it's crazy yellow. We love that. Awesome! As if the Dinoot trailers weren't already small enough, you managed to find an even smaller one! It should be great behind your cars. 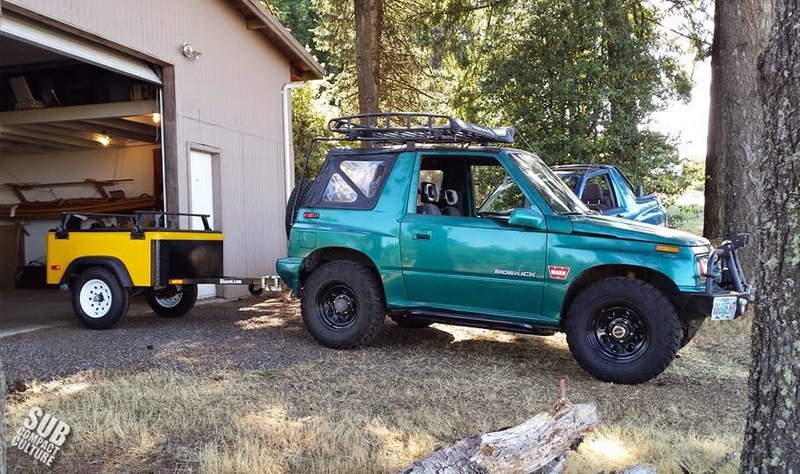 With my Tracker I towed a 1000lb trailer on some pretty serious trails and it did just fine. You won't even notice your trailer behind your vehicles. But can it fold in half and fade to lovely shade of pink in just one season? Mondo cool lil' trailer! I look forward to the roof top tent solution you discover. I'll never want an RV, but a small trailer could make car camping a more civilized experience.